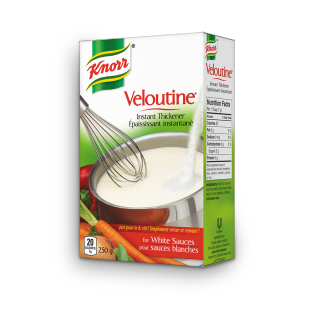 Veloutine Instant Thickener for White Sauces allows you to add the perfect thick consistency to your white sauces. Veloutine Instant Thickeners enhances the texture of your gravies so you get perfect gravy. Potato starch, lactose, maltodextrin, rice flour, monoglyceride and sulphites. 1. Bring mixture to be thickened to a boil. 2. Stirring constantly, sprinkle in Veloutine. 3. Use about 3 tbsp (45 mL) for every 1 cup (250 mL) of liquid. 4. Boil 1 minute. 5. For a thicker consistency, add more Veloutine and boil 1 minute longer.